Are you sending invoices to the same client regularly on a monthly, weekly or daily basis? Square Invoices makes this even simpler with our recurring payments feature. There’s no need to chase down clients, accept card payments over the phone, or re-enter the same details every month. We’re making billing more affordable with invoices, including recurring payments, being free to send. We’ve made it easy for you to set up regular, recurring payments, so you can get paid fast and reduce the general administration time that’s involved in business management. Not a Square seller yet? Sign up for your free account here to send an unlimited amount of recurring invoice payments for free — and you only ever pay a small fee when an invoices is paid by card online. Go to Invoices in your online Square Dashboard. Select Recurring from the drop down menu. Specify the frequency of the payments. Click Automatic Payments if you want to bill customers with card on file automatically. Select a customer from your Customer Directory, or enter a new name and email address. You can enter up to nine recipients. If your customer doesn’t have a payment card on file, you can check the box next to Allow customer to save their card. Fill out the rest of the invoice, including any discounts. Check the Allow Customer to Add a Tip box at the bottom, if appropriate. When your clients receive the invoice in their email, they can pay you securely online. If their card was already on file, it’s charged automatically. The money is usually deposited into your bank account in one or two business days from the processing date. Get paid faster with online invoices. Which recurring payment solution is right for my business? Best for Automated recurring billing for amounts that don’t change week-to-week or in any given billing period - like subscription services. Easily invoice repeat customers for dollar amounts that may change from week to week or in between billing cycles. What kinds of businesses use recurring payments? Lots of different businesses set up recurring invoices to reduce admin time and get paid faster. For example, florists delivering a weekly workplace arrangements, dog walkers, fitness centres and yoga studios, corporate cleaners, and subscription services like weekly coffee deliveries all use recurring payments. Businesses with a higher average transaction value, such as wedding planners, or home and repair services also set up recurring payments as a convenient way to split a total invoice cost across multiple payments, making it easier for their customers to manage payments. What are the benefits of setting up payments on a recurring basis? If you regularly invoice your customers on a set schedule, recurring payments are a massive time-saver. Rather than creating identical invoices week after week, or month after month, you’ll be streamlining your bookkeeping with recurring invoices. In just a few moments you can set up recurring payments that you schedule to go out at a time that’s most convenient for your clients, and most valuable to your business cashflow. It’s simple to set up recurring payments with Square. You can send as many Square Invoices as you like for fee, and pay a small processing fee only when a customer pays you by credit card online. You can set up recurring payments to be automatically emailed to your clients at the frequency you choose, or select to print them out and deliver them to the job site. If your customers store their credit or debit card info on file, recurring payments are paid automatically — it really is that simple! How will you use recurring payments for your business? Get started today . How much does it cost to set up recurring payments? Square Invoices are always free to send, and there’s no additional cost to schedule or send recurring payments. If your customer chooses to pay securely online with a credit or debit card, you pay just 2.2% per invoice. When customers authorise you to securely store a card on file, it’s still just 2.2% per invoice paid — and you’ll get paid even faster. How long does it take for the money to reach my bank account? Funds paid by invoice are deposited directly into your bank account as fast as the next business day. Can I set up recurring payments to go out monthly? You can set up recurring payments to invoice your customers daily, weekly, monthly, or even annually. What if my customer’s transaction is declined? When you set up a new series of recurring payments, you’ll be given the choise to allow your customer to save their credit card on file. The customer will see their first invoice from the recurring series with a checkbox to save their card payment details. Just like all other invoices, your customer is allowed several attempts to enter the right payment information (card number, expiration date). If the card fails after those attempts, both you and your customer are notified by email that that particular transaction failed. The recurring series stays intact and will continue to send the next instances in that series, but you will have to re-send a single invoice to ensure that you still receive payment for the invoice instance that failed. What if my customer’s credit card is out-of-date? When you have a recurring series that includes a saved CoF payment, the credit card on file at some point in the series your customer’s card may go past its expiration date or fails for another reason. In that instance, Square automatically falls back to sending an invoice where your customer willi be prompted to enter their new card information. Both the you and your customer will be notified that the card on file wasn’t charged, and the customer can still pay the regular invoice through the normal invoice payment webpage (where they will also have the option to save a new card on file, too). In the case that a new/different card is saved on file, you will receive an email notifying you that the invoice has been paid with an updated CoF. Start saving time and getting paid faster. 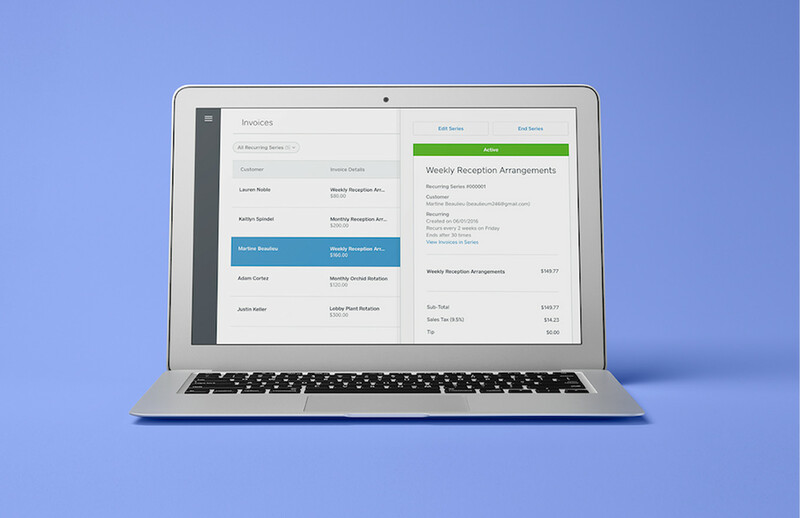 Sign up to Square to send Invoices and recurring payments today. Click here to get started. Sign up for Square Invoices. Send invoices from anywhere and get paid faster than ever.